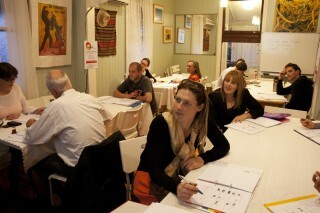 Spanish Learning Centre offers courses for all levels and ages. Take our online quiz to help you find your level. Everything about Spanish Learning Centre and its head teacher, Patricia. A little about the language and where it's spoken, as well as what's happening in Brisbane with a Spanish or Latin flavour. Enrol for an SLC course today. We welcome you to enrol in Spanish lessons in the Second term of the year 2019. We are open for enrolment from absolute beginners to advanced conversation. Term 2 goes for 9 lessons, 2 extra lessons will be on a Friday. Classes are offered in four levels, all of which can be done during the day, in the evening or a little later. Why study Spanish at Spanish Learning Centre? At Spanish Learning Centre, you will study with a professional Spanish Teacher with years experience in Australia and overseas. You will receive a certificate after you finish each level of your Spanish course, which you can add in your CV and also it will be useful as a reference when you go study overseas. The pedagogical approach is to give to the student a solid vocabulary and a grammar base where the student can easily build up their conversational skills. A solid base structure in a language learning is a must to have, otherwise you will invent your own language and adopt bad habits when conversing. Everybody has different learning ways, some learn with pictures, music, repetition, writing, etc. At Spanish learning Centre we use all modern media available to facilitate your learning. We provide you with a plan of study which give you discipline, books, audios that you can put in your car, home, etc. The teacher will help you with the 4 keys of learning: reading, writing, listening and pronunciation, all this areas are cover with fun class activities. That is why Spanish with Patricia has existed for 16 year in Highgate Hill. Everybody is welcome and if you are shift worker this is the place to be. You can come to any lesson on your level during the week, morning or evening. If you are unable to attend, you Skype your lesson from wherever in the world you are. Welcome to the beautiful world of Spanish, here you just not learn the language, you learn the culture. Enrolment is open for the First term of the year which starts on the 18 February. It cost $265 the course material is included in the price. Our enrolment policy is flexible, so if you would like to join a course that has already started, please email patricia@spanishlanguage.com.au or call us 0400638340 or 07- 32172220 or skype patricia.braunoz. for businesses, Patricia has taught several companies in Brisbane. Companies enjoy Patricia’s structure and teaching contents. Spanish has help the executives to get to know each other in a very different ways. The day starts with “Buenos días” and finishes with an “Hasta mañana” – Spanish at lunch time at your premises, right in the heart of Brisbane. This course is strongly recommended to all HR that want to increase a positive dynamic within the company. If you’re unsure which level to take, we have some quick quizzes which will make it easier to decide. Term 1 goes for nine weeks, one hr. and 30 minutes, beginners are welcome to enrol. $265 Prices include gst. Term 2 begins the week commencing 13 May and goes for 9 weeks on Monday or Wednesday. We will have 2 additional lessons on Friday. Term 4 begins the week commencing 7 October and goes for nine weeks. Prices include GST.